The Dow rose 172.54, or 2.1 percent, to 8,472.40, after falling 40 points in the early going. The broader Standard & Poor's 500 index rose 19.32, or 2.1 percent, to 920.26, and the Nasdaq composite index rose 37.20, or 2.1 percent, to 1,829.54. Investors rushed back into stocks as profits at a handful of companies indicated the economy might be gaining strength. Gains in homebuilders, retailers and other consumer discretionary stocks led the market sharply higher Thursday. 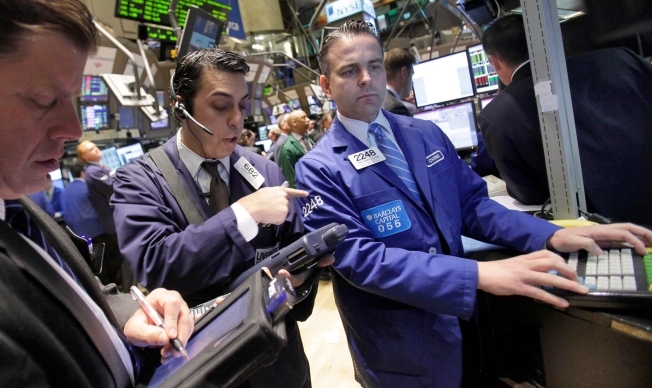 The Dow Jones industrial average surged 173 points after four days of losses. Government bond prices jumped after an auction drew strong demand. Traders focused on several better-than-expected earnings reports and welcomed news that the Federal Reserve took the first step toward removing the numerous emergency lending programs it launched last fall at the height of the financial crisis. The third successful Treasury auction of the week helped boost confidence that Washington will be able to raise enough money to fund its economic recovery programs. Shares of homebuilders rallied after Lennar Corp. said orders for new homes jumped 63 percent during the second quarter and posted revenue that beat expectations. Retailers and other consumer discretionary stocks jumped following an upbeat report from Bed Bath & Beyond Inc. The home furnishings store said its fiscal first-quarter profit climbed 14 percent as sales rose after the liquidation of rival Linens N Things. Stocks had started lower after the government said new claims for unemployment benefits rose by 15,000 to 627,000 last week. The market expected a drop. Joe Saluzzi, co-head of equity trading at Themis Trading LLC, said some of the day's gains likely reflect portfolio managers buying up stocks to pump up their returns ahead of the end of the quarter on Tuesday. "I think the window dressing is a big deal," he said. "There's just a force underneath the market that wants to keep it higher." According to preliminary calculations, the Dow rose 172.54, or 2.1 percent, to 8,472.40, after falling 40 points in the early going. The broader Standard & Poor's 500 index rose 19.32, or 2.1 percent, to 920.26, and the Nasdaq composite index rose 37.20, or 2.1 percent, to 1,829.54.